In the Latin Quarter, on the night of May 10 and 11 1968, the Gaullist police attacked students with unprecedented brutality. The students were pummelled, charged, choked and blinded by gas. Hundreds were wounded. The young workers, high-school pupils, and university students of France are rising up in indignation and anger. 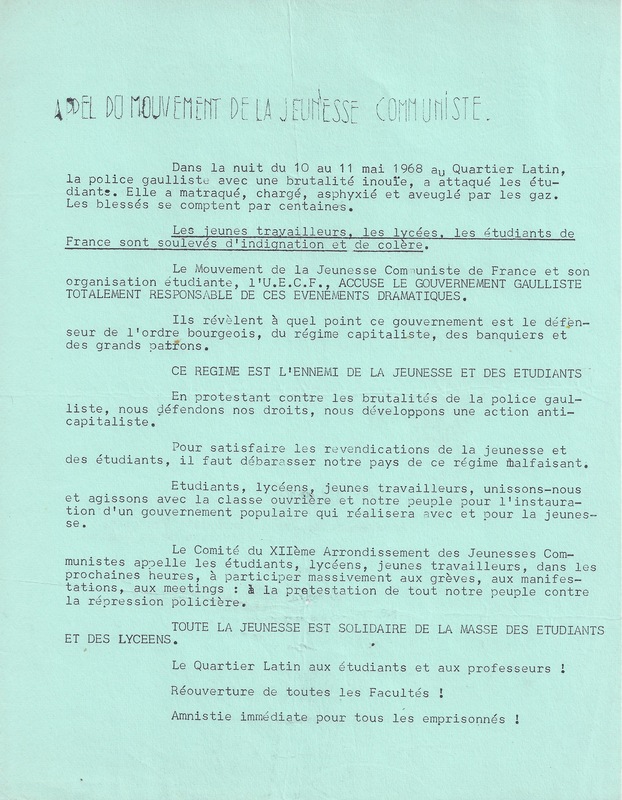 The Communist Youth Movement of France and its student organisation, the U.E.C.F., ACCUSES THE GAULLIST GOVERNMENT OF TOTAL RESPONSIBILITY FOR THESE DRAMATIC EVENTS. They reveal the extent to which this government is the defender of the bourgeois order, the capitalist system, bankers and big bosses. THIS REGIME IS THE ENEMY OF THE YOUTH AND OF STUDENTS. In protest against the brutality of the Gaullist police, we will defend our rights, and develop anti-capitalist action. To meet the demands of the youth and students, our country has to be rid of this evil regime. Students, pupils, young workers, let us unite and act together with the working class for the establishment of a popular government that will be realised with and for youth. a massive participation in strikes, demonstrations, rallies over the coming hours: in the protests of all our people against police repression. ALL OF THE YOUTH ARE IN SOLIDARITY WITH THE MASS OF STUDENTS AND HIGH-SCHOOL PUPILS. The Latin Quarter for students and teachers ! Reopening of all the faculties ! Immediate amnesty for all the imprisoned ! and the Federation of the Left. 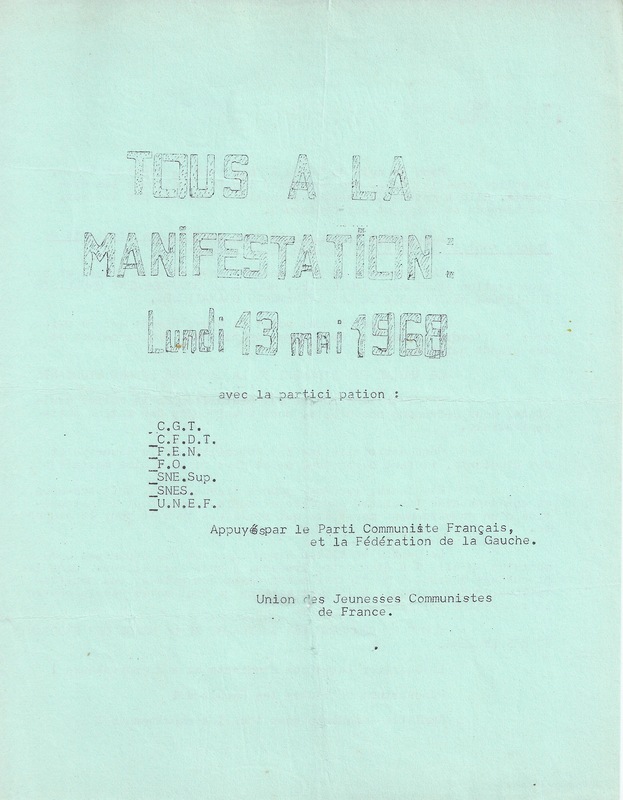 Union of French Communist Youth.